This 23 T has a great old school look and was built right. 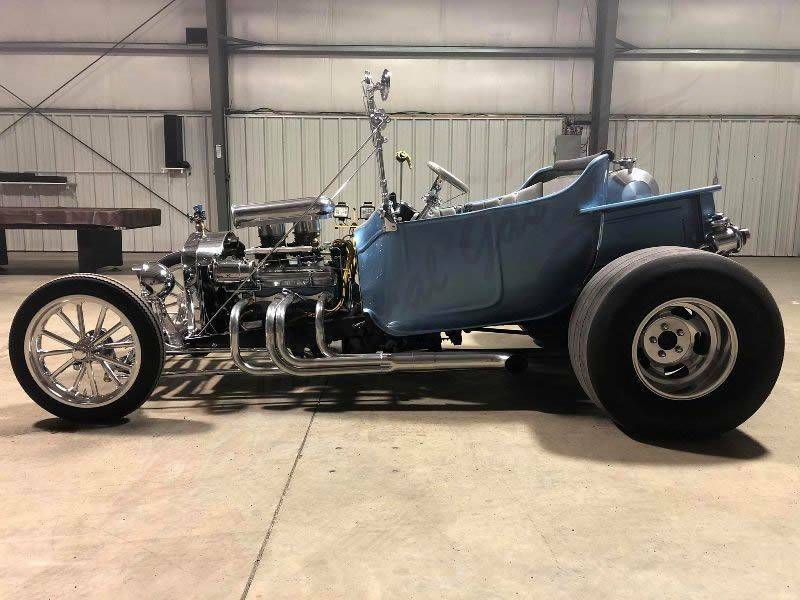 You see a lot of these riding around with glass bodies but this one is true 23 Ford Model T steel. The body is solid and looks great painted in a Metallic light Blue. 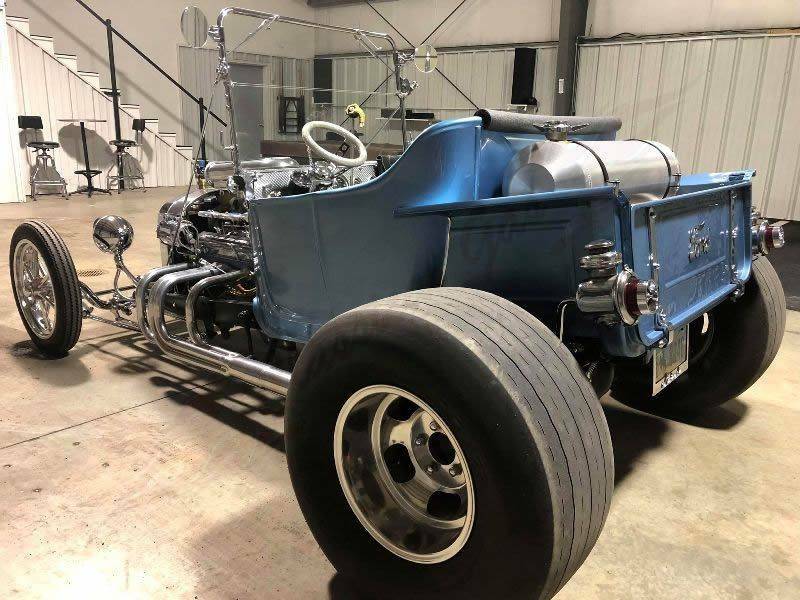 It features chrome headlights with eyebrows up front and in back are the very cool 1923 taillight housings that have been fitted with custom lenses. It has the tall style windshield up front in the original chrome frame. The radiator shell is also 1923 Ford and is all chrome. The front wheels are 12 spoke Radir wheels with deep offset aluminum slots in back. This is the period correct look and they are wrapped with Mickey Thompson street slick tires. When you have an exposed motor like this it better be looking good which is exactly the case. It is powered by a 265 V8 out of a 55 Corvette and chromed out all over. From the scoop up top to the oil and transmission pan this thing is almost all chrome. The motor was completely rebuilt and upgraded with a performance cam. 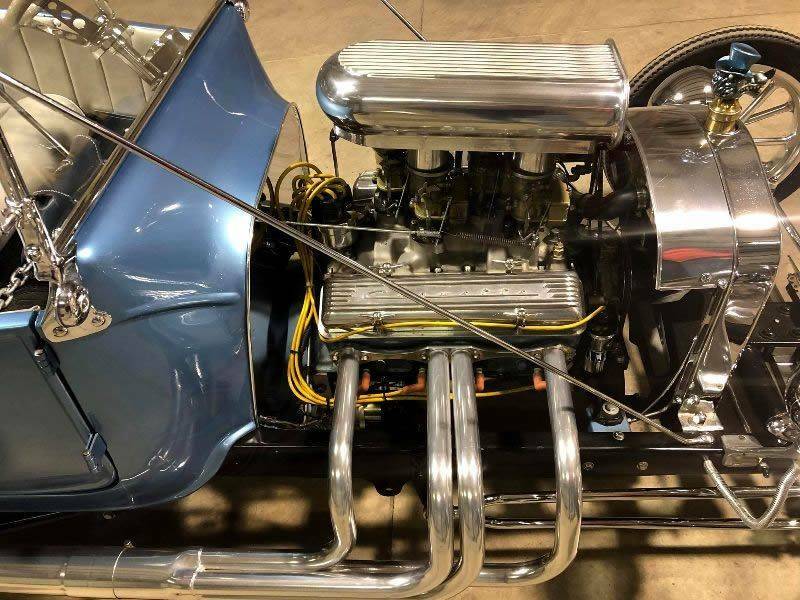 Other nice features on the motor include the polished distributer, electronic ignition, Flamethrower coil, Weiand intake, polished 12 volt generator and ceramic coated headers with side pipes. It has 4 Stromberg carburetors for the look but only 1 is plumbed to help with gas mileage. Backing the motor is a 2 speed powerglide transmission that sends power back to the 8 1/2 inch rear end which is also out of a 55 Corvette. The car has a 6 inch deep tubular axle up front and the suspension utilizes coil springs with boggy leaf springs in back. There are zero heating issues and it has a 3 core radiator with extra brass tank on top. 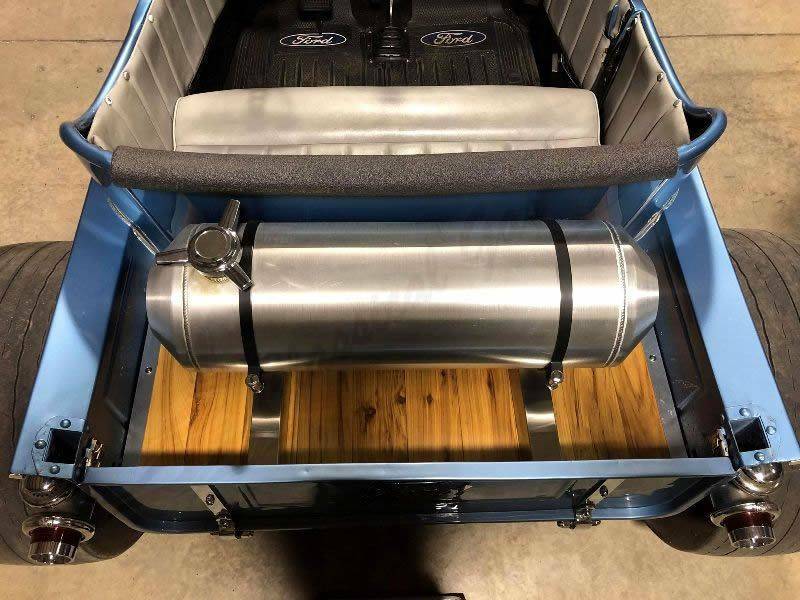 Sitting in the rear bed is a spun aluminum 11 gallon gas tank which looks great. The interiors on these cars are usually kept pretty simple but this one features things like the spun aluminum dash bezel which really sets it apart. The Black gauges go all the way across the dash and there is a Sun tachometer on the column. 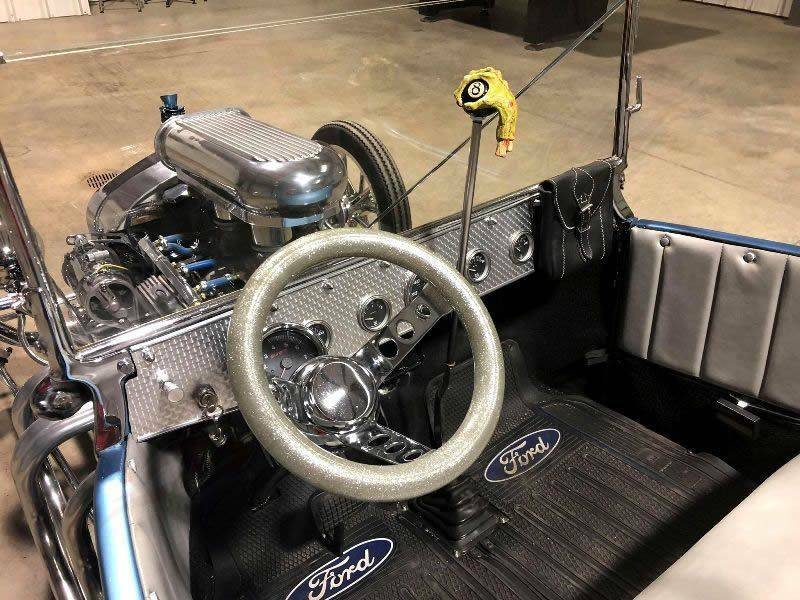 The tall shifter is a must have on a car like this and it is topped off with a very cool shifter knob. 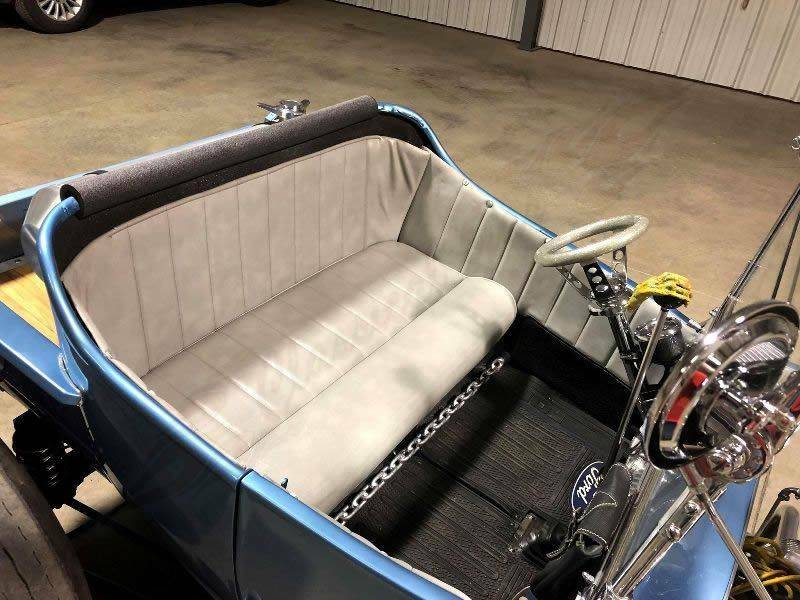 The upholstery work is done in grey vinyl and is in good condition.